the involuntary muscle comprising the myocardium and walls of the pulmonary veins and superior vena cava, consisting of anastomosing transversely striated muscle fibers formed of cells united at intercalated discs; the one or two nuclei of each cell are centrally located and the longitudinally arranged myofibrils have considerable sarcoplasm around them; connective tissue is limited to reticular and fine collagenous fibers; contraction is rhythmic and intrinsically stimulated. a special striated muscle of the myocardium, containing dark intercalated disks at the junctions of abutting fibers. 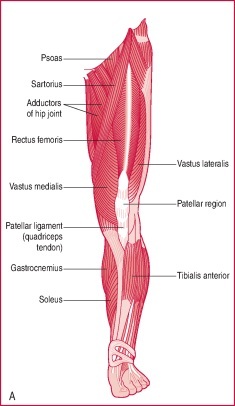 Cardiac muscle is an exception among involuntary muscles, which are characteristically smooth. 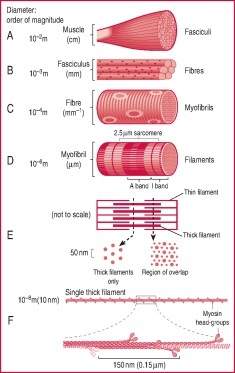 Its contractile fibers resemble those of skeletal muscle but are only one third as large in diameter, are richer in sarcoplasm, and contain centrally located instead of peripheral nuclei. 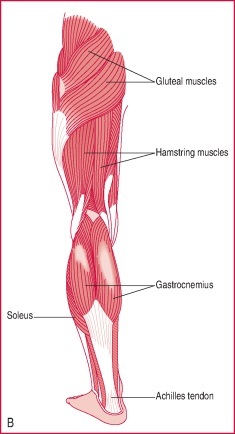 Compare smooth muscle, striated muscle. 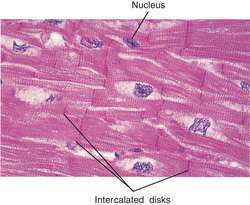 The muscle forming the myocardium, consisting of anastomosing transversely striated muscle fibers formed of cells united at intercalated discs. Fig. 91 Cardiac muscle . The intercalated discs enable the rapid transmission of excitatory waves across the tissue. 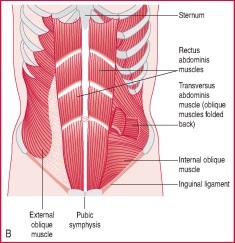 a type of vertebrate muscle found only in the HEART, which appears to be halfway between INVOLUNTARY MUSCLE and STRIATED MUSCLE in that its fibres are striated, but contain a single nucleus (see Fig. 91 ). The action of cardiac fibres is to produce strong and rhythmic contractions from within, even when removed from the body (see MYOGENIC CONTRACTION). 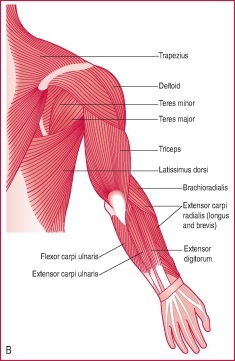 Unlike striated muscle, cardiac muscle does not become fatigued even though it is repeatedly stimulated. The heartbeat is controlled by the AUTONOMIC NERVOUS SYSTEM. The tissue donors had no clinical signs of chronic renal failure, a condition known to increase cTnT concentration in blood even in the absence of cardiac muscle damage. Researchers at Emory and Georgia Tech have developed a method for purifying cardiac muscle cells from stem cell cultures using molecular beacons. They went on to show that cardionogen could stimulate mouse embryonic stem cells to differentiation into beating cardiac muscle cells. Part of the problem is that we expect skeletal muscle to do things that we'd never expect cardiac muscle to do. Further investigations revealed that the enlargement of the heart is in fact attributable to a greatly increased number of cardiac muscle cells. Specifically, the team found that their intervention halted transforming growth factor beta (TGF-beta) secretion at a precise location called cell receptor type 2 in cardiac muscle cells. Moreover, says Steele, the lactic acid created in large amounts by fructose is preferentially used by the heart--and that causes "otherwise soluble muscle protein, like cardiac muscle protein, [to precipitate] out of solution . These results are in contrast to studies by others using adult bone marrow-derived hematopoietic or skeletal myoblast stem cells which do not produce new cardiac muscle tissue after injection into infarcted hearts. found that it is possible to expand up to seven-fold, in vitro, rare CD133+ stem cells from human cord blood and then grow them into cardiac muscle cells. It was also unknown which of the proteins in the cardiac muscle is the target of these fatal immune attacks. 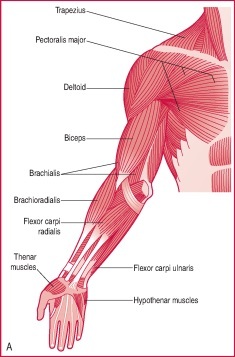 But [skeletal muscle] could not provide the type of relentless work that cardiac muscle could.